Holiday Sale Alerts! | Fashion. Style. Beauty. | Life is short. Live well. Many of you are working on getting all that holiday shopping done. Here are some sale alerts you REALLY want to know about. We all know about my absolute love and desire for ADAM. 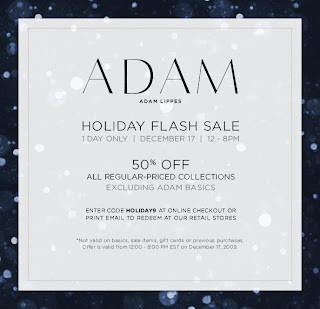 Starting Thursday, December 17th, genius designer’s Adam Lippes’ collection is available for 50% off (*faint). The sale is available at the ADAM flagship store in the Meatpacking District of New York as well as stores in Buffalo and Bryn Mawr, NY.The discount is also good on ADAM’s website , as well as over 250 stores around the world that sell his merchandise, including Bergdorf Goodman, Jeffrey NY, Intermix, net-a-porter, Neiman Marcus and Lane Crawford. I envy anyone who can get to this sale. 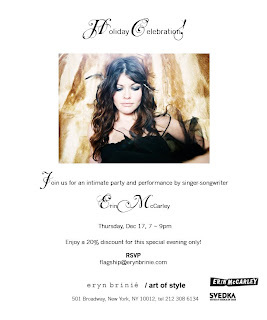 If you want to run into me later tomorrow night, I’m heading to Erin McCarley’s performance at my new favorite Manhattan store, Eryn Brinie, from 7-9 (although I’ll be there on the late side). Shoppers will enjoy a 20% discount, live music and festive libations. If you’re here in NYC, I would totally take advantage of this opportunity. For those out and about this weekend, take advantage of the Be & D Sample Sale on December 17th & 18th from 9am to 7pm at 35 West 36th Street, 10th Floor West, NYC (between 5th/6th Avenues). Sale items for this celebrity favorite bag line include the as-seen-on Gossip Girl’s Taylor Momsen Garbo Studded Shoulder Portfolio in Turquoise Lambskin (originally $995) at a sample sale price of $400 and the Ruffle Kan-Kan Portfolio in Red Patent Leather (originally $595) at a price of $300.